Colten HATES getting strapped into this. He LOVES wheeling around in it. He HATES when I take him out if he’s not done! I HATE having to get him strapped into this. I LOVE watching him wheel around, go fast, explore, and be mostly independent. I HATE that he’s “stuck” in this position. Colten HATES that he cannot get up the stairs in this. He LOVES going fast down driveways. He HATES that he cannot reach anything low to the ground. I HATE that he can roll away so fast. I LOVE that he can roll away so fast. I HATE that there isn’t a guide handle on it for us to steer/push/pull him. Okay, ready to watch him in action? Here’s a video of Colten wheeling, spinning, turning and loving it… [ Watch: Mean, Green, Rolling Machine ] Sometimes I wonder if I should be putting a helmet on him when he’s in this!!! I really could go on and on with this. There are a lot of things to truly love about the mobile stander. He is wheeling around upright while bearing weight on this legs. This is awesome because he loves to wheel around in his Bumbo wheelchair but this gives the added benefit of putting him in a standing position. Standing means bearing weight, even if the straps/cushions are helping to hold him upright. Bearing weight means building bone density. Because of a reduced use of their legs, less walking/weight-bearing, and lack of feeling throughout their legs, people with Spina Bifida have decreased bone density. This was the whole purpose of the treadmill study we did, remember? I know it only ended 6 months ago but man it feels like FOREVER ago! The stander puts him upright, at the height of other kids about his age. The footplate he stands on is not that high off the ground so he can now access things more easily at that height. 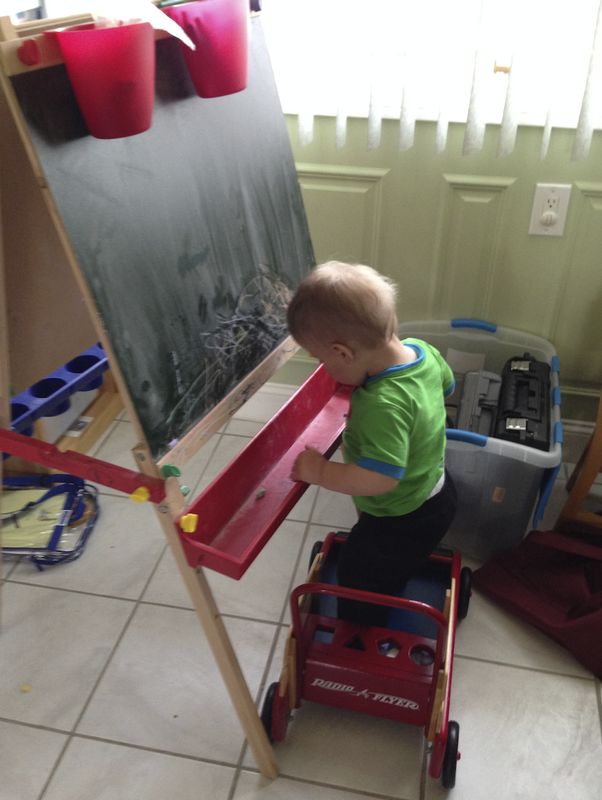 For instance, he likes to pull up to stand at our easel and draw on the chalkboard or whiteboard. For a while, all he could do was stand there and look because it took so much effort for him to stand, he could not let go of either hand. Then he got to where he could hold himself standing with one hand and draw with the other. This stander gives him even more flexibility. He doesn’t have to concentrate so much on standing, just enjoying the play experience. We had him outside at the sand table – same thing. He could just enjoy without the added stress of stabilizing himself. We used this feature today during the OT part of his therapy session, so he stood up for about 25 minutes while working with his therapist! Taking the wheels off means he is stuck in one spot unless I wheel him away (the stabilizer wheels are locked while standing unless I need to move him, then I unlock them). This is good because it helps him focus on just standing – HUGE for strength building and bone density. Using the mobile stander without the “big wheels”. I realize I haven’t posted since March so we do have some more updates… Might want to go refill your coffee! Colten started into the new programming through EarlyOn, via the Macomb Intermediate School District. 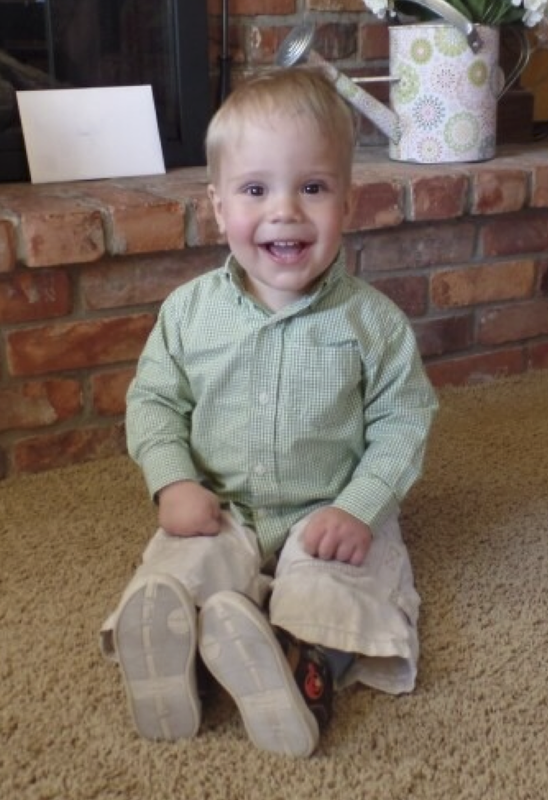 Once he turned 18 months, he now goes to one of the Infant Preschool Program schools twice a week. One of the days, he is part of a group “class”. This lasts for just under an hour and is a “high functioning” physical needs class. There are three children in the class total – 2 girls and him. The other girls are about 2.5years and the other is almost 2 – and she also has spina bifida myelomeningocele! We actually know this family through our Beaumont therapies and some Facebook support groups, so this has been nice for both Colten and me 🙂 In the class they do some gross motor play, fine motor/food exploration, and active songs that encourage both fine and gross motor movements. On Colten’s second trip to the school during the week, he gets 1-on-1 physical therapy. 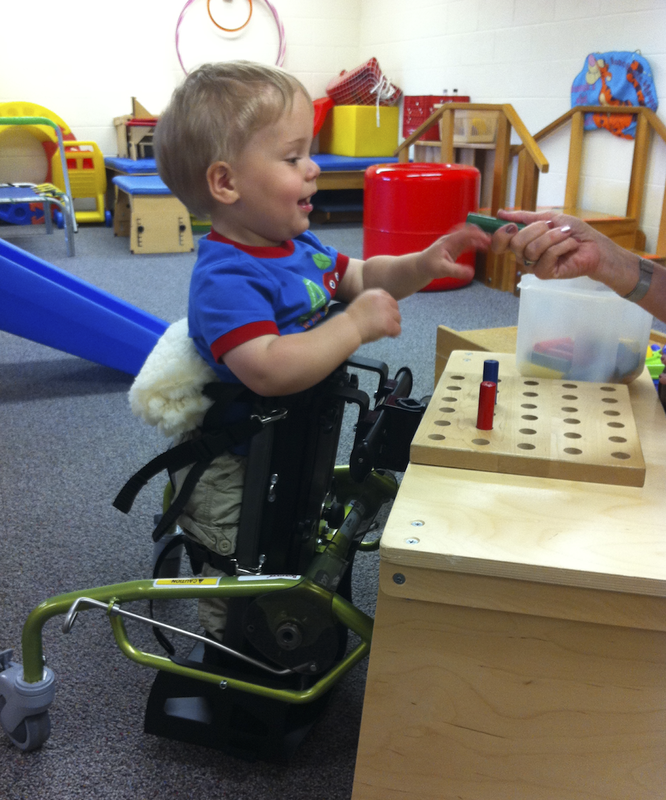 Colten also still receives physical therapy once per week at the Beaumont Children’s Rehab center. So yes, we are usually at 3 appointments/week and I had to do some schedule re-arranging to maximize my work days so they do not conflict with his therapies as much as possible. Another reason why I am thankful most days that I work for myself! 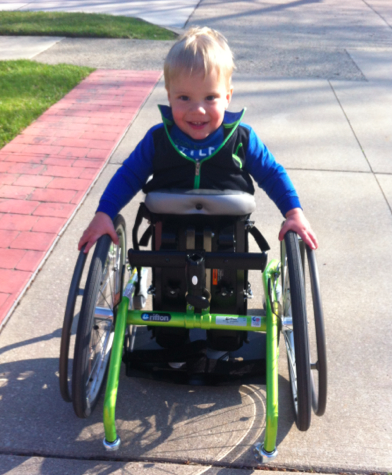 Just this week at physical therapy, Colten showed up some cruising skills! The last time we intentionally worked on cruising was back in February when Colten tried out TheraTogs for the first and only time (could be helpful or annoying; about $1000, not covered by insurance). He needed a lot of assistance from his PT to cruise along a bench but he did. And how does he cruise now? Without any help from his PT, just some delicious bribery… This video is of him at home today. He was already pretty tired out from an hour of PT/OT – 30 minutes of that was also spent standing in his mobile stander so his legs are exhausted, but look at him go! Moving forward, we expect May and June to bring some “stuff”. He goes back to the Myelo clinic at Mott in May, where we see all his specialists during a 3-4 hour appointment. He will get an MRI done that morning as an annual check. His last MRI was shortly after he was born. What are they looking for? Anything. All people with Spina Bifida, as we understand it, have what is called Tethered Cord. Due to the surgery on the spine, scar tissue builds up and in order for the spine to properly lengthen, or the spinal cord, the scar tissue needs to be removed, or detethered. While tethered cord supposedly occurs in all cases, NOT ALL CASES REQUIRE SURGERY. Surgery is only required if/when the tethering causes issues. Most often these are neurological issues (hello, your spinal cord is being yanked!) but from what we have read on other SB family blogs, it can sometimes take a while for parents and doctors to agree about the best timing of this surgery. I am not anticipating this is any issue for Colten at this time as he seems to be progressing quite well. Just trying to explain part of the reason behind annual MRIs. I believe that the MRI is of the spine and head, and so for the head, they’ll be looking at the size of his ventricles and making sure his shunt is working as expected. They can also examine his Chiari II Malformation from this MRI and see if it is still mild. I have heard of a few families seeing marked improvements in their child’s Chiari II Malformation in the first few years so it will be interesting to see if his has changed any. Given how much Colten has grown in the past six months, I think he’ll be casted for a new pair of AFOs, and if that’s the case, we should be able to get those maybe in June. And just like any other 1-1/2 year old, he also knows how to use things to get into trouble. Here he is STANDING in the wagon so he can get up higher to get the chalk! Standing in the wagon. Not really safe at all. Kind of therapeutic though! Good balancing Colten! While this makes us nervous, it takes incredible balance to stand in this thing and not have it roll out from under him. Kind of impressive in a evil-knievel-therapy kind of way… Although now that I look at the picture closely, I see the one wheel is being held in place by the easel. Smart kid. Going into June, we’ll be back at Mott for another surgery. We are hoping for a somewhat quiet, fun-filled (do those go together? no, not with 3 little boys!) summer in July and August though! Richard will be off from teaching of course, unless he picks up summer school teaching, the boys will be out of the daycare they’re in right now, and we have some camp programs lined up for Parker and Max that should be exciting for them! We’re spending some of our free time now exploring a lot of area playgrounds. 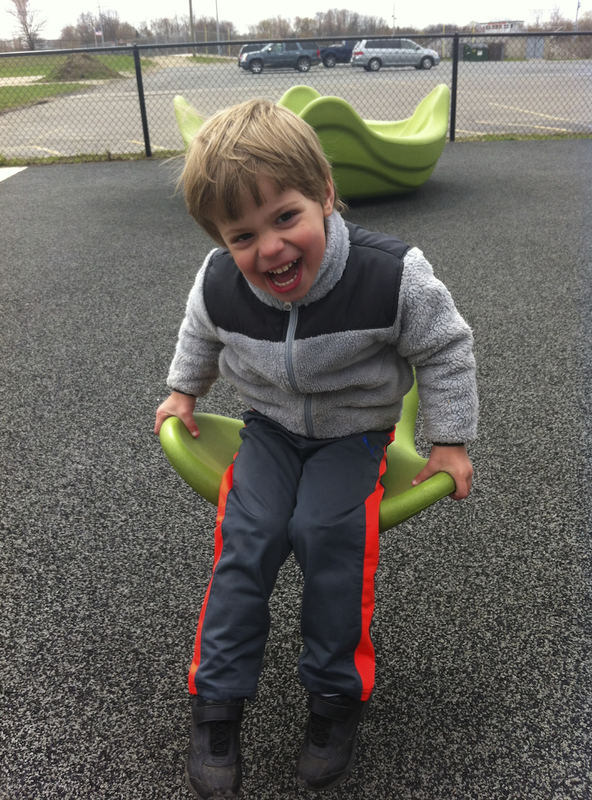 We have a list of supposedly accessible playgrounds we are checking off one by one. 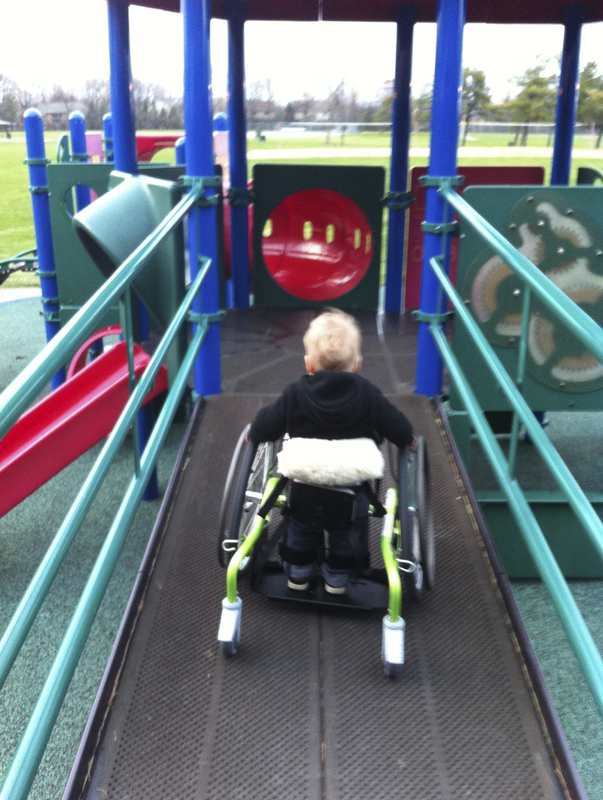 We try to find playgrounds with ramps so Colten can either go up in one of his “wheels” or easily crawl/climb. We love ones with rubber flooring best because he HATES crawling on bark chip. I don’t blame him! There’s a great list of accessible playgrounds on NPR’s website and we are adding new ones to their database as we find them. It’s a great tool, but very incomplete for Michigan. The best ones are “all abilities” playgrounds, where they’re very inclusive and have play things for climbers, rollers, walkers, and crawlers. They are usually also sensory-based with sound areas, texturized areas and sometimes even smell-based items! We found a GREAT one in Northville at Cooke School this past weekend. Not that Northville is local for us, but we were out that way (Richard took Parker to LegoFest!). Max enjoying one of the all-abilities playgrounds. This one was in Northville at Cooke School. It was AWESOME! Pretty sure that school must house a full special needs program because this playground had it all, even FOUR wheelchair swings! Boulan Park in Troy had two big structures with ramps. The entire play area had rubber flooring, too. However, there wasn’t much for Colten to do once he got UP the ramp, so we took him out and let him crawl around instead. Although he loved zooming DOWN the ramps. Helmet?!?! Yikes. 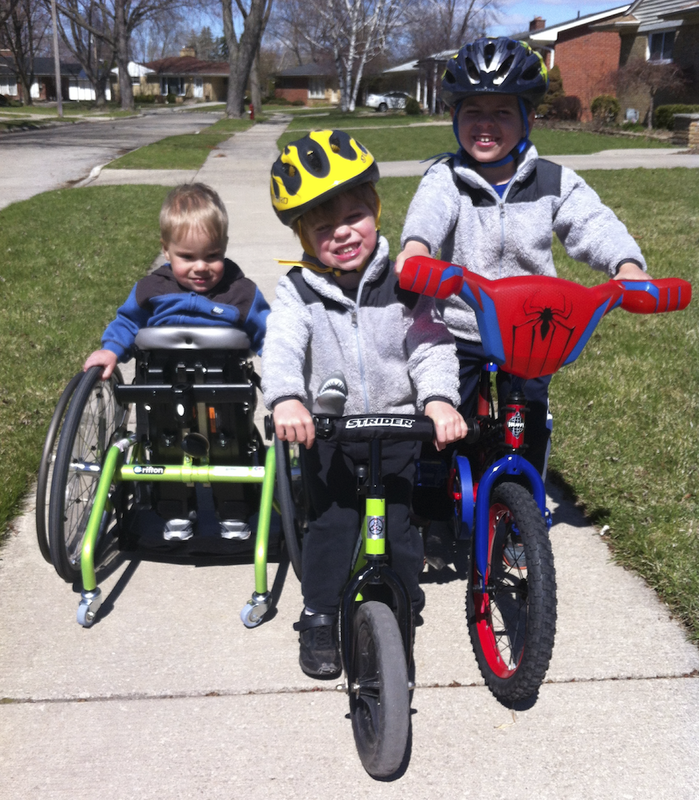 In August, we are participating in our first Walk-n-Roll, an event that supports the Spina Bifida Association of Michigan. We’ll post more about this later but if you want to learn more about joining our team and/or donating, please visit our Walk-n-Roll page! While we hope to raise some moola of course, our other focus is getting our great team of supporters to come with us to the event and have a good time! Hope you can join us! MAX is finally potty-trained! I’m sure he wants the entire blog-readership to know that 😉 He can be embarrassed later. We’re excited because he’s been stubborn and we’ve been lazy and we finally just did it over spring break. Whew. He is also getting quite good at riding our little balance bike! PARKER learned to ride a TWO-WHEELER! No training wheels for this kid. He went from the balance bike to his big boy bike. I only needed to “help” for about 15 minutes and he was off and riding. We’ve enjoyed some nice rides just the two of us. He went for a 3-mile ride his first day and a 4-mile ride two days later. He loves loves loves it and feels like SUCH a big boy now. This entry was tagged accessible, AFOs, Chiari II malformation, cruising, earlyon, friends, MISD, mobile stander, myelomeningocele, occupational therapy, physical therapy, playtime, SBA, spina bifida, Surgery, Treadmill study, walker, walking, walknroll, wheelchair. Bookmark the permalink.